Today we commemorate one of the saddest moments in American history. The assassination of President John Fitzgerald Kennedy is an event that still, 50 years later, hasn’t wrestled itself from our collective consciousness. Everyone who was old enough on this day in 1963 remembers exactly where they were the moment they received the news. They remember how they got the news and remember how they felt when they received that shocking information. For this first grader it was one of the first times I can recall any event outside our home and neighborhood in Orange, California. I wish I could say that I could recall the 1963 World Series that took place one month earlier, but I can’t. This violent jolt into the larger universe via television and radio was my first frightening and sad look into a larger world. It was the first time I recall my parents crying. Our family lived a few blocks from the elementary school that I attended. I would walk the short distance home for lunch. While sitting at the kitchen table with my four younger brothers and sisters and my mom making lunch, a neighbor who lived across the street, burst into our home without knocking. She was screaming hysterically. She was the one who delivered this horrific and shocking news. I remember the distress and sadness I felt as I returned to school for the balance of the afternoon. The President and First Lady were the only two public figures I knew at the time. I knew they had a daughter who was my age. She had a little brother who had the same name as one of my little brothers. They were both named after the same person. That person had just been shot and killed. All I could think of was how sad I’d be if someone killed my dad. 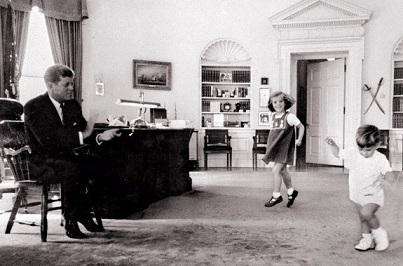 I felt so sad for the Kennedy children and their mom. The afternoon session at school started late because the teacher entered the classroom several minutes after the class was scheduled to begin. My classmates were talking about the assassination when the teacher finally entered the room. It was her job presumably to try and spend the balance of the afternoon giving us comforting thoughts or at least distract us from this horror. Instead she sat in front of us and sobbed uncontrollably for the next three hours. She would periodically try and compose herself and begin to say a few words and then start crying again. I knew my mom was home crying as well. My dad was in Stockton, California, on business. He cancelled the rest of his schedule and raced home to be with us. He arrived a few hours later and now, even he was crying. In the days that followed I watched the President’s assassin get shot and killed on live television. I watched the largest state funeral in our Nation’s history. For the first time adults didn’t know what to say. The world seemed to get very quiet. As the years, decades and milestone anniversaries of this tragic historic day roll by, the sadness and almost surreal like shock of the most powerful man in the world being shot down at the age of 46 and only one thousand days into his Presidency, has lost none of its impact. The old saying, ‘time heals all wounds’ somehow does not apply to this tragedy. The youngest man ever elected President was starting to show true leadership, courage and some grace under pressure. Most importantly, he represented hope. It was hope that was the other victim that day. The optimism of America on the morning of November 22, 1963, seemed to be boundless. By the afternoon, American optimism suddenly seemed to be a thing of the past. President Johnson acted swiftly and decisively to make an exhaustive inquiry into the death of his predecessor. He appointed a blue ribbon, bi-partisan panel to lead an investigation where no expense was spared. The Warren Commission’s report, which was exhaustively detailed, thorough and came to the correct conclusion, was not without its flaws. The overwhelming evidence was described in great detail and pointed directly to Lee Harvey Oswald as the lone gunman. It was concluded that he killed the President and was not part of any conspiracy. Oswald’s lifelong pattern of violent, anti-social, volatile and unpredictable behavior didn’t make him a likely candidate for participation in a well coordinated conspiracy of these proportions. A man of so little consequence and stature made this crime seem all the more shocking. It is easier for humans to grapple with the notion that a moment in history, which had such a profound impact on our nation, was the work of multiple, well coordinated, nefarious forces rather than one unbalanced individual. It is very unsettling to think our lives can be the result of something so random. Certainly the life of a President couldn’t be snuffed out so crudely by such a small man. Certainly not this President... It is a hard thing with which to come to grips. ‘There just has to be something more...there just has to be.’ are the instinctual thoughts we all have as it relates to this crime. I have spent a great deal of my life believing that. There are thousands of individuals who have tried desperately to prove that this is the case. It has been said that big doors can swing on little hinges. A bolt action, mail order rifle that cost twelve dollars and change, wielded by a troubled individual, with no apparent redeeming social value, is a very small hinge. John Fitzgerald Kennedy, the President of the United States, the leader of the free world and a man of immense talent, intellect and charisma on the other hand, let’s just say doors just don’t get any bigger. It doesn’t make any sense. It doesn’t compute. In the depths of our souls we believe that if there was at least a formidable criminal element at play here, it would give some balance to this equation. Any type of serious research and study however always leads right back to the fact that Lee Harvey Oswald killed the President of the United States and a Dallas police officer on the same day. He also drew a gun on a policeman while being arrested. The same rifle that killed the President was used in an assassination attempt in Dallas some months earlier on General Edwin Walker. Historical revisionism has tried to turn a sociopathic killer into a benign patsy to suit the agendas of whoever is trying to write the next best seller on the topic. All of the conspiracy fetishes supposedly come from the fact that Oswald was denied his day in court. There is no circumstance or scenario that anyone could conjure up that would not lead anybody to believe he wouldn’t have been convicted of killing the President and a Dallas police officer 45 minutes later. In lieu of the trial that never took place, this assassination has become the most analyzed, scrutinized, exhaustively examined, investigated and dissected crime in history. Mountains of documents are combed over by conspiracy buffs who are hoping to “blow the case wide open.” They have yet to find a single shred of evidence to support their theories. It is important to note the conspiracy industry really didn’t get into full swing until 1975. This coincided with the release of the entire Zapruder film, the pardoning of Richard Nixon after Watergate and a Senate sub-committee headed by Frank Church that revealed a CIA that had spun far out of control and had been involved in a variety of illegal black-ops. America found itself for the first time faced with the prospect that their government was capable of crimes that heretofore were unimaginable to most of its citizens. Why not attribute this crime to one or more of America’s not so secret cabals like big oil, organized crime, the military industrial establishment and/or our intelligence community? Throw in perceived cold war enemies like the Soviet Union and Cuba and you have a cottage industry. Now the near four decades old drum beat of doubt about the case has taken root in the minds of a majority of Americans whose consensus is that, “we will never know for sure what happened in Dealy Plaza on November 22, 1963”. We do know for sure what happened in Dallas. The uninformed shouldn’t constitute the majority. I suppose this type of ignorance isn’t terribly surprising in the era of Fox News. We had a Vice Presidential candidate from a major party who thinks the world is less than 10,000 years old. She now works for Fox News. There are people who think the current President is a Muslim who was not born in the United States. There are those who don’t believe in climate change. What chance does anybody have to convince anybody of anything? I used to believe that conspiracy theorists were truth seekers. I am now convinced the opposite is true. Their writings tend to be suppositional tomes that just don’t hold water. Their annual symposiums, which take place in Dallas each year on this date, have been likened to tent revivals as opposed to think tanks. I am always struck with an overwhelming sense of frustration that the conspiracy industry has distracted people from not only the truth about the death of a President, but has taken the focus off the life of John Fitzgerald Kennedy. We could honor this man and his accomplishments by embracing some of the principles he exemplified. I think the 50th anniversary of this event calls for an end to this conspiracy nonsense. It is a grotesque misrepresentation of history. America and the memory of the 35th President of the United States deserves better. Maybe the sadness that I felt as a child regarding this horrible day in American history is because somehow I knew then what I know now and that is that we have yet to see the likes of a John Fitzgerald Kennedy grace the stage of national politics. The person that comes closest is our current Commander in Chief. Maybe my sadness also stems from the way his opponents treat our President these days. Maybe my sadness comes from the feeling that our country seems to be made up of Oswald’s who kill people in movie theatres in Aurora, Colorado, or who shoot up a crowd of people in Tuscon, Arizona, and in the process deliver a life threatening head wound to a Democratic Congresswoman. Maybe my sadness stems from being born in the same country that produces monsters who murder children with automatic weapons in elementary schools. Maybe our country has turned into what Dallas was supposed to be in 1963. Maybe America has turned into “nut country”, a term Kennedy himself used while speaking to his wife in Fort Worth to describe their next destination on November 22, 1963. It would appear that despite the unsavory reputation Dallas had cultivated as being populated by fringe right wing, segregationist leaning, gun toting, bible thumping zealots, thousands of its citizens peacefully lined the streets of that Gotham on the prairie to see the Kennedys. They cheered wildly and waved placards declaring their love and devotion to the President. The city of Dallas holds no more responsibility for the death of the President than my home town does for the death of his brother five years later. The wounds that were suffered by our 35th President from Oswald’s bullets were fatal. They also left gaping wounds in the hearts and souls of many Americans. They left a wound from which our country has yet to fully recover. We haven’t seemed to be able to find the proper antidote, the soothing balm or the right medicine to make the pain go away. As we devolve into a country of political obstructionists, theocrats and ideologues, where bellicose hatred and bigotry seem to be the political currency that rules the day, the death of this President will continue to be one of the saddest days in American history. 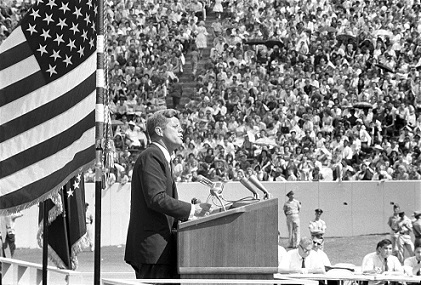 The epochal gravitas of November 22, 1963, is still with us 50 years later. For me the sadness I felt 50 years ago is never too far away either. Today it is palpable. A Thousand Days by Arthur Schlesinger, Jr.